In a different twist to the annual No Dirty Gold campaign backed by environmental NGOs, five major jewelers have pledged they will not use gold from the controversial Pebble copper & gold project near Bristol Bay, Alaska. In a statement issued Tuesday, Jon Bridge, Co-CEO/General Counsel of Ben Bridge Jeweler in Seattle said, "I am pleased to stand with others in the jewelry industry today in announcing our support for protecting Alaska's Bristol Bay watershed from large-scale mining. As retail jewelers, we want to be able to tell our customers that the precious metals we use are mined responsibly-that the materials used in the jewelry they purchase have been mined in environmentally friendly ways, respectful of the Bristol Bay salmon fishery and the communities that depend on it." Joining Bridge in the Pebble gold boycott were Tiffany & Co., Helzberg Diamonds, Fortunoff, Leber Jewelers, Inc., and Alaska's Blake's Fine Jewelry. The retailers are among a group of 28 jewelry retailers, representing 23% of U.S. jewelry sales, who have endorsed the No Dirty Gold campaign's "Golden Rules" human rights and environmental criteria for mining. Last December an advertising campaign was launched in industry news publication National Jeweler, asking jewelers to boycott gold from the Pebble Mine project in the Bristol Bay watershed. Washington, D.C.-based EARTHWORKS placed the ad in the January, February and March issues of National Jeweler. Vancouver-based Northern Dynasty Mines has proposed to build the Pebble copper-gold mine southwest of Anchorage. However, Northern Dynasty has drawn criticism for failing to conduct an effective consultation campaign outside of Alaska regarding Pebble's potential impacts on Bristol Bay. Conversely, Bristol Bay environmentalists have been able to draw on the support of national and international environmental NGOs, fisheries and sportsmen groups, as well as Alaska native interest groups. The involvement of international mega-miner Anglo American in the Bristol Bay project is expected to improve national and international stakeholder consultation. Sean Magee, a spokesman for the Pebble Partnership, told reporters that they are disappointed that none of the jewelers or EARTHWORKS spoke to them prior to Tuesday's announcement. Magee told the Los Angles Times that "there is a lot of common ground between the Dirty Gold camp and the approach we are taking. We support high environmental standards for mining. If the fisheries can't be protected, we won't advance this project." Tiffany's CEO Mike Kowalski-who is also a prominent advocate for reform of the 1872 Mining Law-told the Anchorage Daily News that the company supports Bristol Bay residents who value the region's salmon fisheries over mining, and pledged that Tiffany will avoid using gold from Pebble if it is developed into a mine. However, EARTHWORKS President Stephen D'Esposito told the Anchorage Daily News that mining companies, smelters and refiners also have to help jewelers, such as Tiffany, have more control over their gold supply chain. The Pebble West project is believed to have a measured and indicated resource of 4.1 billion tonnes containing 42.1 million ounces of gold, 24.6 billion pounds of copper, 1.4 billion pounds of molybdenum and additional silver. The Pebble East project is believed to have a 3.4 billion-tonne inferred resource containing 42.6 billion pounds of copper, 39.6 million ounces of gold and 2.7 billion pounds of molybdenum. 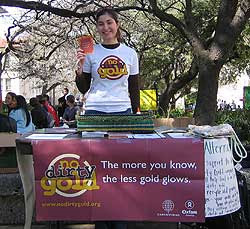 In a report that accompanied the No Dirty Gold announcement of the Bristol Bay gold boycott campaign, EARTHWORKS and Oxfam America highlighted gold mining operations, which they believe, violate basic human rights, refuse to recognize their miners' right to organize through labor unions, or fail to adequately protect worker health and safety. Other mines are criticized for their alleged involvement in armed or militarized conflict, or forced relocation of nearby landowners and/or indigenous peoples. The report also highlights mines which reportedly dump mine waste into oceans, rivers, lake or streams; and calls for ensuring that projects are not located in protected areas, fragile ecosystems, or other areas of high conservation or ecological value. Among the mines criticized in the report are Freeport-McMoRan's Grasberg mine in Indonesia; Newmont's Yanacocha mine in Peru; Barrick's Cortez Mines in Nevada; BHP Billiton's iron ore mines in Australia; Barrick, Teck Cominco, and Newmont's Hemlo Camp mines in Ontario; AngloGold Ashanti's Mongbwalu mine in the Democratic Republic of Congo; Gabriel Resources' Rosia Montana project in Romania; Placer Dome's former Marcopper mine in the Philippines; Newmont's Minahasa Raya and Batu Hijau mines in Indonesia; Barrick's Porgera gold mine in Papua New Guinea; Ascendant Copper's Junin project in Ecuador; Newmont's Akyem gold mine in Ghana; and Anglo American and Northern Dynasty Minerals Pebble copper-gold project in Alaska. Also featured in the report are the former Pegasus Gold Zortman-Landusky mine in Montana; Golden Star Resources' Bogoso/Prestea gold mine in Ghana; Yukon-Nevada Gold's Jerritt Canyon gold mine in Nevada; and the former Galactic Resources Summitville gold mine in Colorado.